Tip #1 Buy a vacuum that has a rotating brush. This will allow you to deep clean your carpet fibres instead of just cleaning the surface. The vast majority of dirt in the carpet is skin and hair that’s normally embedded below the surface. A normal vacuum cleaner (without a rotating brush) just can’t get down into these fibres. This means, after you clean your carpets, they’re probably still dirty. Tip #2: Buy a welcome mat for each entrance to act as a receptacle for large particles and dirt stuck on your shoes. A lot of dirt is deposited into your carpet right at the front entrance of your home. Makes sense really, doesn’t it? By placing a welcome mat at the entrance, you’ll remove a lot of the large particles and dirt on your shoes. If you’ve just has a carpet fitted, ask the carpet fitter for a small cut off of unused carpet and lay this at your front door. This is great for the smaller deposits from your shoes and it also matches the colour, look and feel of your existing carpet. If you’re a tenant and you’ve just moved into a property. Take a visit to your local carpet retatiler and ask them if they have any unuesd cuts that you could use for this purpose (they are always chucking out bits of carpet, so don’t be shy to ask). Tip #3: Did you know, you can prevent the pile of your carpet from being crushed and worn prematurely by putting a throw rug or small carpet in front of especially heavily trafficked areas, like in front of a favorite chair. If you take a look at that area now, you’ll probably see what I mean. This area is normally flatter and more worn than the rest of the carpet. Tip #4: This is a little trick that hardily anyone uses. Move furniture to reach inaccessible spots. Adjust furniture placement – even an inch or two every time you vacuum – will allow the spots crushed by furniture legs to recover. Tip #5: Treat spots immediately (yes, it’s going to be hard if you’re throwing a party, but if you’re not, there’s no excuse I’m afraid). It’s true. Treat spills asap, or it’s likely to set and become a permanent, or much harder to remove. Avoid chemical treatments which may be damaging like the dreaded 1001 type stuff. Start with cold water and kitchen tissue, and in most cases. Tip #6: Keep your kitchen floor clean – grease and oil can be tracked through your house onto carpets. This is normally related to kitchens that back onto the living room. You’ll find that this small area has the vast amount of coffee stains etc. By keeping the kitchen floor clean you’ll also be keeping your carpets clean too! Tip #7: Before using any stain removing product, test on an inconspicuous area of the carpet or rug for colour fastness. We don’t advise that you use any chemicals, but if you do, they can sometimes cause damage or remove the carpet pigment in the area that has a stain. Tip #8: When tackling a stain, always blot from the outside in, never scrub or rub as this will cause permanent damage to the carpet. If you can, use a kitchen tissue/towel. They normally make great stain removal tools as they soak up a wine stain or coke really well! Tip #10: Empty your vacuum cleaner bag/tube as often as you can. You’ll notice an improved suction performance if you do. 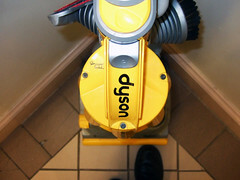 Even if you have a Dyson, you’ll still improve the performance if you can empty the tube as often as you can. This one sounds really obvious, but hey, it works really well. This one rule can make all the difference in the livelihood of your carpet. Simply don’t wear outside shoes in your home. It’s simple—enforce the no shoes rule at all times and your carpet will remain permanently cleaner. The only place you should eat should be either at the table or on the couch. Nowhere else. This way, you contain the areas that can get stained. Now, for all the parents out there, I can hear you screaming “BUT WE HAVE KIDS”, OK, why not confine them to have their drinks in this area instead. That way, you won’t have those little spills and drops all the way through the house. These are the best ways to keep your carpets clean.